A novel named "Doomsday Book" does not sound like the best title for a Christmas tale, yet despite its dire-sounding name and a story that includes a fair share of pestilence and death, Connie Willis' book may be the best Christmas book ever written. It is, at the very least, my favorite Christmas book, as well as my favorite novel for any day of the year. "Doomsday Book" is the story of Kivrin Engle, an English historian who is studying the Middle Ages and has the opportunity to learn first-hand about this time period, thanks to the advent of time-travel in the mid-21st century. Although the 14th century is off-limits to historians, the Acting Head of the History Faculty at Oxford seizes an opportunity when his boss is away at Christmastime to make history by sending a student into a distant century that featured the Hundred Years' War, Joan of Arc at the stake, and the Black Death. I'm writing this piece in late 2013 when the roll-out of the Affordable Care Act, aka "Obamacare", went off the rails when the technology required for its website wasn't tested sufficiently and then failed spectacularly. This circumstance is, unfortunately, not unique to mankind's penchant for major projects. The space shuttle Challenger in January 1986 was allegedly rushed for launch so the event would coincide with President Reagan's State of the Union address. The image of flumes of smoke, blooming like an iris flower over Cape Canaveral, are etched forever in many eyes. Over one hundred years ago, a seemingly unsinkable ship met an iceberg in the cold Atlantic waters and became both a part of recent folklore and a warning to all of the perils of hubris. Life in "Doomsday Book" mirrors these monumental mishaps. Connie Willis told Nick Gevers of InfinityPlus, "We poor homo sapiens are always trying to make desperately important decisions with too little information and too little time." From the first paragraph of her novel, Willis drops her readers into a madcap environment in which the Acting Head of the History Faculty makes a desperate decision to send a young woman into the teeth of a dangerous time in human history. He fudges data to make it happen, while foreseeing his own status in Oxford raised if the mission is successful. Another member of the History Faculty, James Dunworthy, disagrees with the venture, but is powerless to prevent it. He is a father-figure to the young student, Kivrin. He recognizes the danger unto death that the Acting Head is positioning for her. "He hasn't run recon tests or parameter checks," he tells an associate. "We did two years of unmanneds in Twentieth Century before we sent anyone through. He hasn't done any. The man's a complete incompetent." Kivrin is a lamb willingly led to slaughter, an image compounded by her tiny stature and blond hair in braids. When Dunworthy learns of the date of her return, he says, "A rendezvous on the twenty-eighth of December. Do you realize what holy day that is? The Feast of the Slaughter of the Innocents." Despite Dunworthy's protests, Kivrin is eager to become the first medieval historian to visit the 14th century. "I want to go," she tells him. "I want to find out about them, how they lived, what they were like." Connie Willis uses only a few terms to convey the complexity of sending a human being from one date in time to another. There are references to the "net" as the vehicle which opens to allow time travel and closes once the historian has reached her destination. There is the "drop" which refers to the physical location where the time traveler is placed or "dropped", preferably out-of-sight of any people. There are also references to "slippage". The further back in time that a historian travels, the greater risk that she may arrive at a date that is different than the one that was programmed for her. Prior to reading the stories and novels of this author, I'd spent little time in the science-fiction aisles of my local bookstore, but was intrigued when I encountered a Salon.com review that indicated that fans of author George Saunders would also love Willis' work. I soon found that Willis has almost nothing in common with the stories and the style of Saunders. Although some of her tales are set in the future, her characters remind me of the quick-thinking, fast-talking folks in 1930s screwball comedies. Willis loves this genre, as well as the works of P.G. Wodehouse and Dorothy L. Sayers. When Kivrin journeys to the 14th century, she cannot forecast how the experience will change her. A historian who learns only through church records, books and other documents may be able to recite facts and figures of a distant time, yet they cannot fully understand the lives and mental state of the people who loved and toiled during years different than their own. She expects cutthroats and thieves and finds instead a family--a mother, her two young daughters, and mother-in-law--residing in a manor, filled with all of the minor dramas that occupy us for most of our days. She also falls desperately ill upon arrival and the family cares for her during her convalescence when she is disoriented and unable to communicate with them in their Middle English tongue. The youngest of the two daughters, Agnes, is curious at her home's guest and is as bold as any five year old girl in approaching her and filling her in on all of the things that someone her age encounters, whether they're living in one century or another. Meanwhile, in the 21st century, an unrecognizable strain of influenza sweeps through Oxford, causing a quarantine, befalling the one programmer who could pull Kivrin out of the 14th century along with many others. It is speculated that the virus was somehow communicated from the earlier century to the latter when the "net" was opened, allowing Kivrin to time travel. A leitmotif employed majestically in "Doomsday Book" is the sound of bells, ringing across the ages, from a bell choir visiting Oxford from the United States to a church bell ringing in the parish nearby the manor where Kivrin lies in a sickbed. Hardly a page is found in the thick novel in which a bell is not chiming or tolling. Little Agnes wears a bell tied by a thread around her wrist and although she promises to not allow it to ring while in church, the bell will not be silenced. The bells also serve as a reminder that they may give comfort and communicate important information when all of the world's technology may fail. While reading (and re-reading) "Doomsday Book", I thought of a true story told by the late Dirk Koning of Grand Rapids, Michigan. Like myself, he had dedicated many years of his life to technology and free speech through public access television. He had served as the Executive Director for Grand Rapids' Community Media Center and was in demand around the world as a public speaker. On a visit to Malawi in Africa, he was humbled by a request from a village chief, who had listened patiently to Dirk Koning's speech about the various forms of technology that would be brought to the village to improve it, before making his people's single and simple need known. The video below provides this story. May it resonate within you now or one day when you are confounded with your smartphone and iPad or tinkering with your Google glasses. I've never felt as close to a story's characters than I've felt for those created by Connie Willis, particularly Kivrin and everyone she encounters in the 14th century. Willis shares her tale primarily in third-person, but thanks to a device implanted in the young heroine, the reader hears her in first-person when she speaks directly into it by cupping her hands close to her mouth, as if in prayer. "I sat between the girls and shared a trencher with them. We had meat, I think venison, and bread. The venison tasted of cinnamon, salt, and the lack of refrigeration, and the bread was stone-hard, but it was better than porridge . . ."
Willis deftly employs "novel thought", as the term is defined by Douglas Glover, and its effect adds an obsessive quality to Kivrin's character. Glover describes "novel thought" as if it were a thread, sewing a novel together. "It functions by concentrating on time and motive," he writes in his essay, "Notes on Novel Structure", and expounds that through "novel thought", characters are always doing three things: (1) looking back, remembering where they have been, and why they have come to where they are, (2) assessing where they are now, (3) looking ahead. Kivrin turns events of her past, present and possibilities for her future over and over in her thoughts, just as we are rarely "in the moment", but instead projecting ourselves backward and forward through our minds. Adrienne Martini reflects on Willis' style: "In addition to her deft comic touch, Willis is also a master at fully immersing the reader in her world without resort to clunky informational dumps . . . she is so keen at focusing her attentions on her characters and how they respond to the time they are experiencing, rather than painting vast canvases for them to walk across. The difference is subtle, yes, but important." 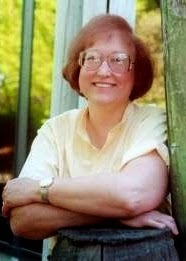 Connie Willis is the author of fifteen novels, including four time-travel books: Doomsday Book, To Say Nothing of the Dog, Blackout and All Clear--five short-story collections. She is also the recipient of numerous Hugo and Nebula Awards. She resides in Greeley, Colorado, which celebrates its famous resident through its website, Greeley Unexpected. For more on this author, visit her website HERE and take in Lorraine Berry's excellent, extensive, two-part interview with her at Talking Writing, A Magazine For Creative Writers and Readers. Labels: book, John Bloner Jr.